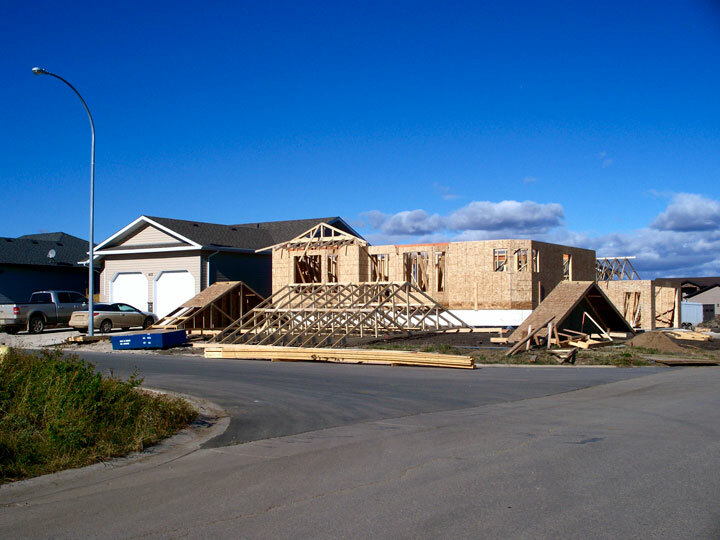 Tisdale: There have been some delays in the progress of this house. It is constructed on a concrete basement on the corner of Forester and Newmarket and was begun September 1. It has an interesting use of the corner lot by not making the garage a part of the house and placing it in was will be the back yard of the lot. Real estate in China is an outstanding investment so there is no shortage of capital to construct new complete and modern cities. The problem is some of these great places have virtually no inhabitants despite being located near enormous natural resources. Paris, France: This is the second in a series of photo essays that take us through Paris. This day's adventure takes us to the Eiffel Tower then through the centre of Paris on the Seine River on a boat tour. Michael has recorded some of Paris' most important and iconic scenes in this 103 pictures in this photo essay. Saskatoon: Summer is over and the Crawfords have put the motor homes to bed for the winter and celebrated Thanksgiving at Mozart. We hear a bit about harvest and coffee row and Gerald fills us in on an art show and the latest theatre presentation in Saskatoon. Paris, France: This year's auto show in Paris focused on "green" cars with low or zero emission and auto makers brought to the show their version of the future of automobiles. Mike Townsend was in Paris and here are ninety-eight remarakble images that give you a chance to tour the show right along with him a weeik ago today. Regina: Sunday was pretty much a golden day throughout all of Saskatchewan. Matthew and Dawn Shire went with some friends and their two families to Regina's Wascana park for a picnic supper. This story has 58 pictures that celebrate the event with the water the geese and an enchanting evening. Tisdale: It happens every year, fall arrives and yet every year it seems remarkably different. Perhaps its the sequence, maybe its the intensity but there is a mystery in this seasonal change from summer to winter. Is it the regrets of a summer that just didn't work out or the anticipation of yet another winter. What ever it is we need to check it out both visually and in our minds. Saskatoon: A great visit to the Drumheller area of Alberta with some pictures as the Crawfords wrap up their summer camping season. Gerald tells of the passing of a friend and the triumphs of Kelly Chase. Tisdale: Tisdale's Anglican minister came to town this summer and reports that he and his wife are very happy in their new home which is more than a thousand miles from where they grew up in the Maritimes. Tisdale: The Anglican Church's fall sale began this morning and runs all Friday 9:00 until 5:00 and on Saturday morning. There is a huge variety of items all displayed so you can browse to your heart's content. Tisdale: With three new members the photo club starts off another year as they looked into various competitions and projects while showing off this month's photo shoot dealing with the theme "shiny." Tisdale: This is the largest Lutheran rummage sale I have seen with excellent items for sale and the sale continues Friday and then on Saturday morning. Tisdale: It was a truly spectacular fall this year but fall is a fleeting thing that doesn't last long as today's wind cleared away most of the remaining coloured leaves with only the shrubs still showing lots of colour. Here are some pictures taken this past weekend around Tisdale and at Greenwater Lake Provincial Park. Tisdale: The Ambulance base for Tisdale and district has been on the corner immediately east of the north entrance to Tisdale Hospital. The time has come to expand the facilities to accommodate equipment and staff in a better and larger building. That new building is nearing completion and here are the pictures that show the building's development. 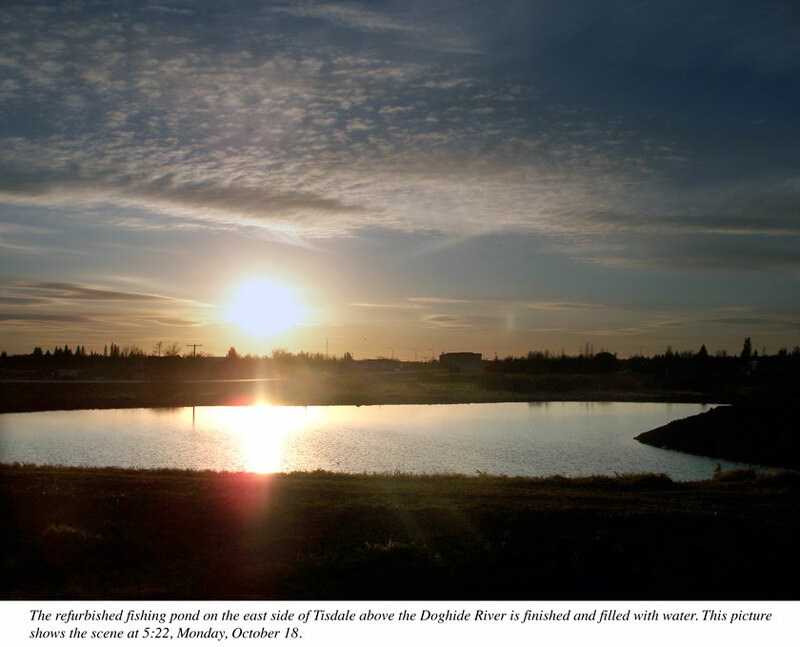 Tisdale: About a decade or more ago the borrow pit east of Tisdale on the north side of highway #3 was stocked with trout and during the summer dedicated fishing folk could be seen trying to catch one. But the fish were unsustainable and this spring the pond was pumped empty and this fall it is being modified. Porcupine Plain: Tisdale and area superannuated teachers held their September meeting at the Cove at Greenwater Park then went into Porcupine Plain to tour the excellent museum. Saskatoon: We haven't heard from the Crawfords since the end of August and since then they have obtained a much newer motor home and are all set to make a trip to Alberta this coming week. This report catches up on some of the friends of the Crawfords. 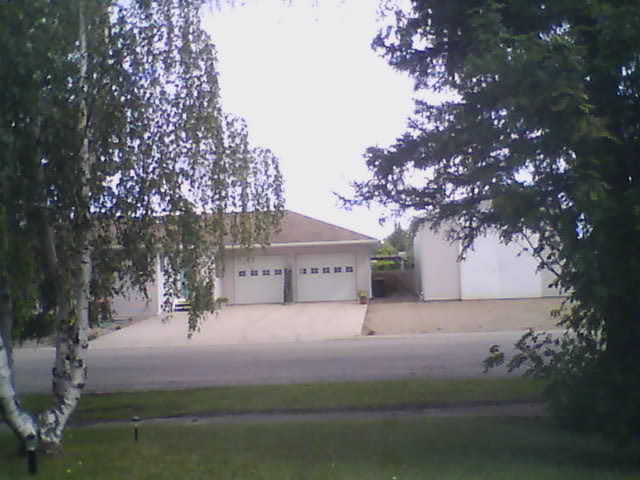 Tisdale: Here is our first look at the turning colour of the leaves in the Tisdale area. Victoria, British Columbia: Its the talk on every news show on radio and television as the a private members bill and the Federal government are determined to get rid of the long gun registry. All but three of Canada's police chiefs want the registry to be maintained because it is information that police can use to determine if a threat is possible with an individual. Ensign is produced, published, and hosted each day by Faster Than Light Communications of Tisdale, Saskatchewan, Canada.